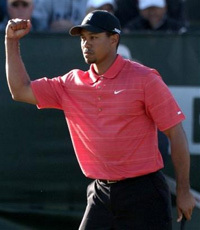 Much to my disappointment, Tiger Woods did not capture the victory at the Masters this past weekend. The green jacket went instead to Zach Johnson, a perfectly pleasant-sounding man from Iowa. While I do not begrudge the former Drake Bulldog for outplaying everyone (include Tiger) on the beefy Par 5s of Augusta, I am still upset that the best golfer in the world didnâ€™t take the title. I root for Tiger Woods, for reasons that are probably a bit selfish. I want to be able to say that I watched the most dominant athlete in the world during his prime. I want the premier sportsman of the decade to be a well-educated man with no criminal record instead of a hard-luck case from Newark, NJ that overcame a murder conviction to be the best strong safety in football. I want to be able to talk about a great golfer while playing golf with other golfers. Selfish justifications, perhaps, but not bad ones. The guy is an anomaly. He is just so far ahead of everyone else. In a tournament, it is Tiger and then the rest of the field. The crowds expect him to win (twelve Majors will do that), and are downright surprised when he doesnâ€™t. I root for that kind of consistency; the fewer the data points outside the trend line, the better for an analyst like me. I like knowing that something is a near lock. And I cheer for that kind of thing. I guess that makes me a front runner in the sport of golf. But I do not have that dirty, empty feeling that I assume people have when they all of a sudden start rooting for the San Antonio Spurs or the San Diego Chargers. Pulling for Tiger is a good thing. Iâ€™m rooting for a classy athlete that works very hard, donates tremendous amounts to charity, and is am ambassador of American sportsmanship. You donâ€™t see me pulling for Roger Federer just because he also collects championships (though Iâ€™m sure heâ€™s a really nice guy, for a Swiss). In the end, I think people shouldnâ€™t feel bad about cheering on Tiger. Heâ€™s earned it, and you as a sports fan have earned the right to root for a winner.